At last month's Home Care 100 conference, post-acute care leaders sat down with health system and managed care executives to describe the benefits of collaboration. 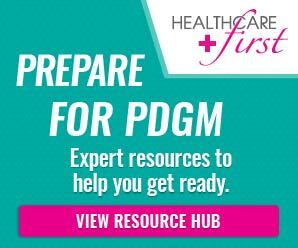 As public and private payers move in the direction of value-based payments, they asserted, this level of teamwork is the best way to improve patient outcomes and satisfaction while keeping healthcare costs under control. Putting together all the necessary pieces to create a successful partnership is not easy, everyone agreed. Relationship need to be ongoing and mutually beneficial through foreseeable and unforeseeable ups and downs, not merely transactional. Data sharing is not enough; interoperable, integrated systems are needed to create meaningful alignment. Administrative obstacles must be removed to facilitate submission of authorizations for home health. Payers believe that creating true clinical programs that deliver a differentiated experience for their members require complete clinical transformation. Reimbursement, as always, is the dominant factor. Panelists agreed that payers today are looking beyond ways to lower unit cost. Of greater concern is finding innovative payment policies that will drive better patient outcomes and experiences. Ms. Guillotte confirmed that LHC Group's message to health systems and payers is not that they can reduce short-term costs but that they can lower lengths of stay, readmission rates, and ED utilization over time and keep them lower by achieving better patient outcomes. Some might find the group's tactical recommendations to be on the severe side. The blueprint to sculpt a home healthcare agency that will attract a health system partner, they asserted, begins with awareness, which requires scoring, identifying, and eliminating an agency's lowest performing clinicians. Health systems, ACOs, and other physician groups want to see patient outcomes, financial commitment, and willingness to take on risk. They are not interested in hearing sob stories about nursing shortages or reluctance to let a longtime employee go. "Health systems will leverage both carrots and sticks," they said. "While they are optimizing their network design, expect them to drive volume to their higher performing post-acute partners. Also look for them to incentivize those partners to take on responsibility for the entire care continuum." In the experience the panelists shared in Southern California, data indicate that patients are benefiting in all eight of the above criteria. Key indicators are consistently measured to detect the balance between overall cost and quality of care. One of those indicators is used to determine the patient- and cost-benefit of valuing "appropriate care setting" rather than "lowest cost care setting." All partners tracked risk adjusted, 60-day, total cost of care and compared it with home health spending as a percentage of the total. 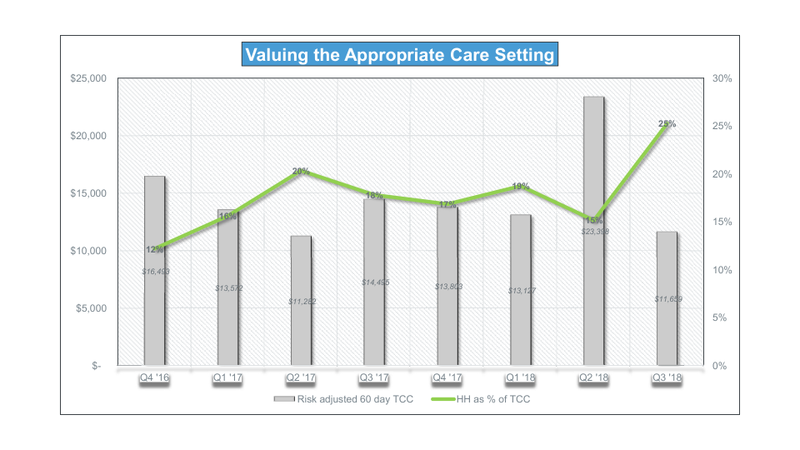 The chart below shows that Total Cost of Care has been experiencing a gradual downward trend, though with occasional outlier quarters. Looking closely, note that cost of home health, as a percentage of total cost, moves in an inverse pattern. In other words, when less is spent on home health, total cost rises. In the last quarter on the chart, July through September 2018, total cost reached its lowest level but spending on home health reached a full 25% of the total.